I grew up eating bolognese sauce, but I had no clue it was actually called bolognese sauce. We just basically called it spaghetti meat sauce in Arabic. As I started to learn to cook and test traditional recipes to learn proper cooking methods and techniques, I made pasta bolognese from an Italian cookbook. Wow! I realized it was pretty much like my mom’s recipe. And I kinda preferred my mom’s actually because it was simpler and healthier. 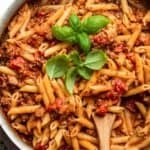 So I’m sharing today this pasta bolognese recipe inspired by the traditional recipe with some healthier swaps. First, I don’t use pork, which is often used along with beef to add more flavor because of its fat. I only use lean ground beef. But I don’t drain the beef after cooking, so it keeps some of juice for the sauce. Second, I don’t use red wine. Instead, I substitute it with vegetable or chicken broth. That still adds lots of flavors and helps tenderize the meat without the alcohol. This is a staple recipe in my house that we make all the time. So I make sure to always stock the essentials to make this recipe. 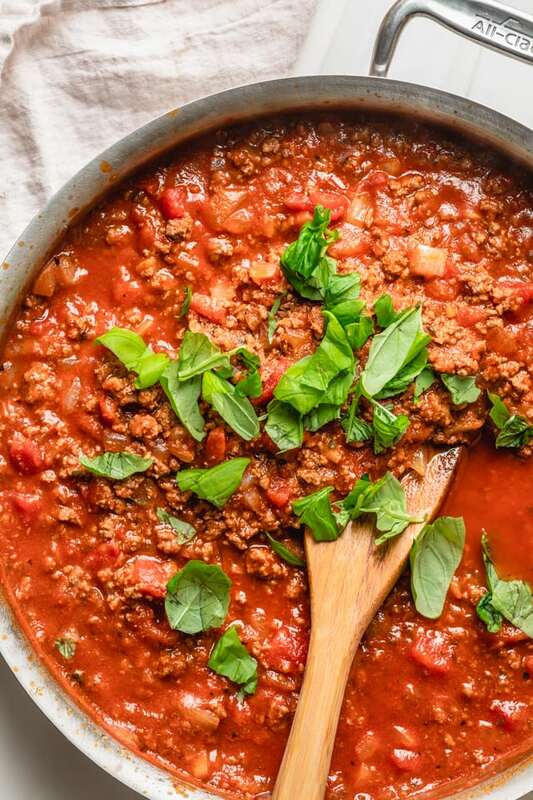 Once you try it, I think it’ll be your go-to easy bolognese sauce! 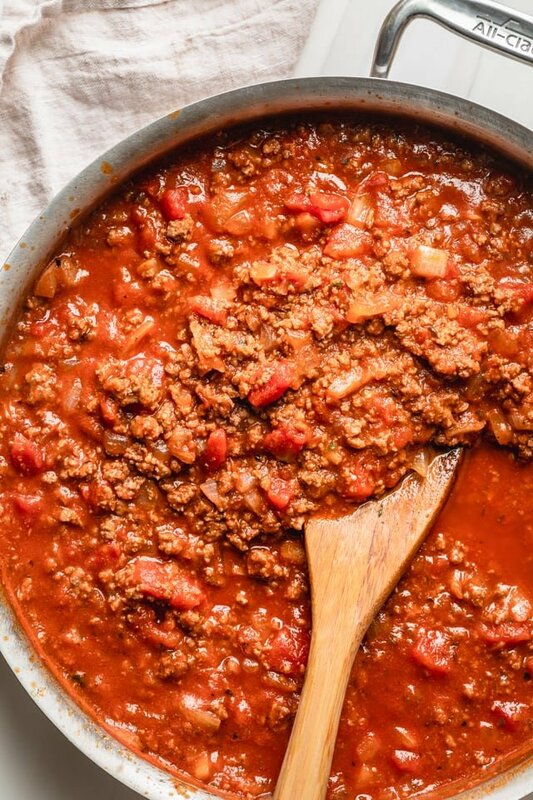 So what exactly is bolognese sauce? 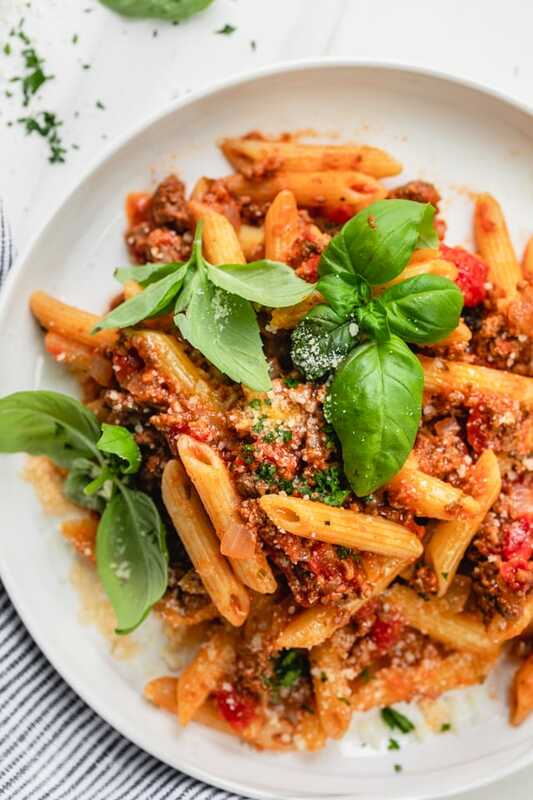 Bolognese sauce is basically a sauce made with ground beef, onions, tomatoes and fresh herbs, and served with pasta. It’s an Italian meat sauce that originated from the city of Bologna. However, it’s more than just beef, onions and a jar of spaghetti sauce. It’s about the depth of flavor you get from cooking all the ingredients in stages and letting the sauce simmer so it becomes thick, rich and hearty. To start, cook ground beef with olive oil, salt and pepper. Then add onions and garlic. I used my frozen garlic that I prepped, but if you have time, fresh garlic is always great. Next, add Italian seasoning, crushed tomatoes, tomato paste and vegetable broth, and mix everything together. You’ll notice the sauce looks done and ready to be served at this point. But it’s very important to let it simmer for at least 30 minutes. That’s how this bolognese sauce gets that deep and rich flavor. After you’ve been patient long enough, you’ll notice that the sauce thickens. Now you can throw on some fresh herbs to finish it off. I like using a mix of fresh basil and flat leaf parsley if you have them. And that’s basically the bolognese sauce ready to top your favorite pasta. I’ve read that in Italy, the sauce is tossed with the pasta, rather than served on top of the pasta. That’s exactly what we grew up doing too. We always combine the sauce with the pasta in the pot. From a practical perspective, this also helps to evenly distribute everything so you don’t have only leftover pasta or only leftover sauce. Am I the only one who hates that problem? Haha! The Italians traditionally eat the bolognese with tagliatelle, a flat strand egg pasta similar to fettuccine. You can use other flat ribbon pasta like parpadalle or tripoline. I personally use this sauce with any and all pastas though. And I love mixing it with tube pastas like rigatoni or penne. 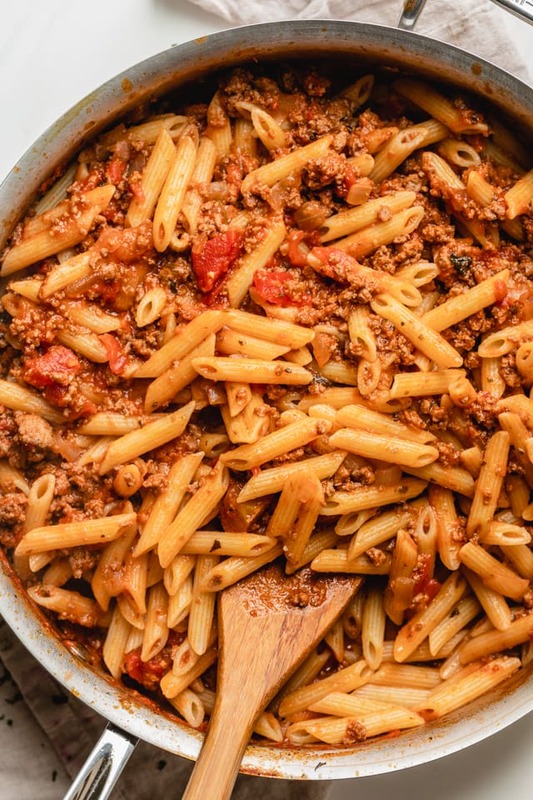 The meat sauce gets stuck inside the tubes when tossed, and it just adds so much flavor to every bite of pasta. Let it simmer for at least 30 minutes, and preferably one hour. 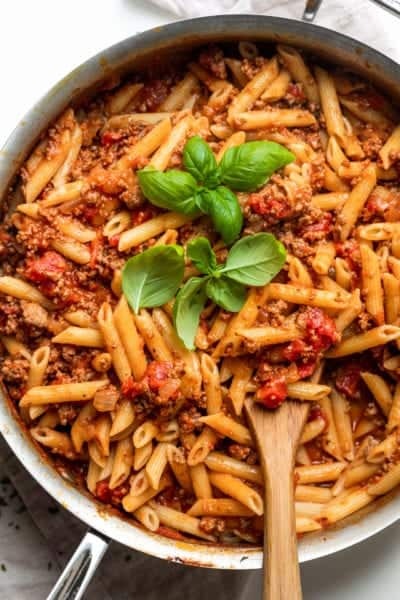 Traditional bolognese in Italy is cooked for around 2 hours. That’s because bolognese gets better the longer it’s cooked, allowing more flavor depth. Finish the bolognese with freshly grated parmesan cheese. It will help thicken the sauce and give it a nice and salty taste. Toss the pasta with the bolognese sauce, instead of serving it on top. This may seem like just a preference, but there’s actually a scientific reason behind it. When you toss the pasta with the sauce, it allows the sauce to emulsify and thicken, which means it sticks better to the pasta. And that means every bite of pasta is adequately coated in this heavenly sauce. Use fresh herbs. While you can start with dried herbs, I highly recommend also adding fresh herbs. You can do this before you start the simmering process and/or after you finish cooking the sauce. This will liven the pasta dish and add a fresh and aromatic flavor to it. 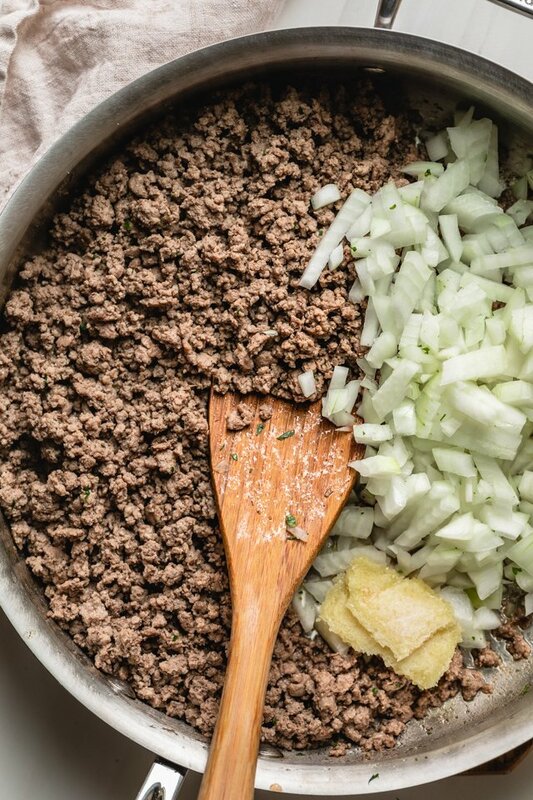 You can see how this recipe is so much more than just a jar of spaghetti sauce mixed with cooked beef and onions. It has a more robust and complicated flavor. 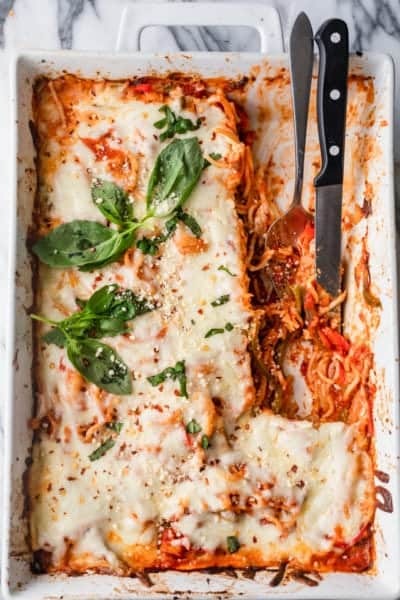 Yet it’s also really easy to whip up – easy enough for a weeknight meal with the family, yet impressive enough for a dinner party. 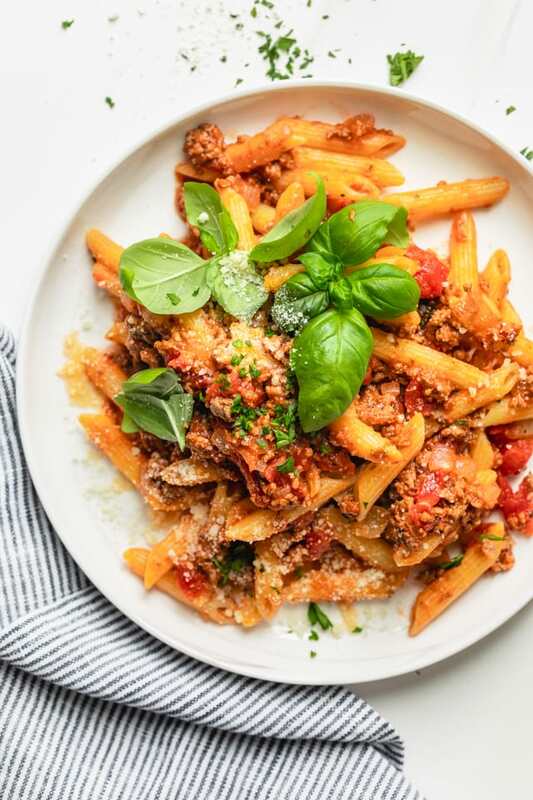 If you’ve tried this healthy-ish feel good Pasta Bolognese recipe or any other recipe on FeelGoodFoodie, then don’t forget to rate the recipe and leave me a comment below! I would love to hear about your experience making it. And if you snapped some shots of it, share it with me on Instagram so I can repost on my stories! Heat the olive oil in a large deep saute pan. Add the beef and season with salt and pepper. Brown the beef and break it into smaller pieces with the back of a wooden spoon until cooked through. Add onions and garlic; and season with oregano, basil and crushed red pepper. Saute the vegetables for about 5 minutes until they soften. Add crushed tomatoes and tomato paste and vegetable broth. Mix to combine, bring mixture to a boil and then simmer on low for 30 minutes. Bring a large pot of salted water to a boil. Add pasta and cook al dente according to package instructions; drain. Toss the pasta with the bolognese sauce and top with fresh basil, if desired. Make Ahead Tips: You can make the bolognese sauce up to 3 days in advance, and then cook the pasta when you're ready. You can change up the seasoning to add other Italian herbs of your choice. Substitute vegetable broth for chicken broth or beef broth if you prefer. You can also use one bouillon cube of your choice with 1/2 cup water. Nutrition: Please note that the nutrition label provided is an estimate based on an online nutrition calculator. It will vary based on the specific ingredients you use. This information should not be considered a substitute for a professional nutritionist’s advice. The nutrition value is for one serving which is about 2 oz of dried pasta. Cooked Pasta Bolognese for dinner using your valuable tips. Love it, specially with the fresh basil.